As long as you don't write your own algorithm, secure encryption is easy. Let's go back to language words this week. I have two new-to-me words that are actually new—so new that a toothpick stuck in the middle doesn’t yet come out clean. Last week, the author and puzzlemaker David Astle proposed the word keming for "any word misread due to improper kerning." See what he did there? So clever. Update: A number of people have noted that keming was coined in 2008 by the photographer David Friedman. The gang of linguists that hangs out at the Language Log had some fun with this, trying to come up with as many of them as they could in a short time. There really are tons of them, as the commenters showed, especially when you allow non-closed compounds: shotgun/gunshot, cathouse/housecat, offhand/handoff, racehorse/horse race, etc. The English professor David-Antoine Williams took a systematic approach and scoured the dictionary (the OED) for pairs like this; he came up with 2,568 pairs (!). He wrote a blog entry about them, and among the points he ponders is what we should call them. One candidate is chi compounds, based on the Greek letter chi (Χ). (Compare the chi in the name of the literary device chiasmus.) Another proposal is bidirectional compound terms. Descriptive but maybe a little dull? 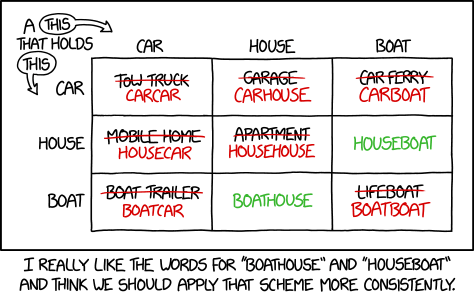 The name that Williams settles on is the simplest: boathouse words, after boathouse/houseboat. I vote for this term. It's easy to remember, and there's precedent for using a name like this. For example, when Brianne Hughes was exploring compounds that consisted of a verb+noun (spitfire, pickpocket), she named them cutthroat compounds after a good exemplar of the genre. So much discussion of new words that we're almost out of time for origins! A quick one today: where does the word zombie come from? The received story is that it's from a Bantu language in West Africa; there are comparable words nzambi ("god") and zumbi ("fetish"). Douglas Harper repeats this theory, but also suggests that it might come from the Spanish word sombra ("shade") to mean "ghost." No one else says this, so it would be interesting to learn what Harper's source is and learn more about that. Fun zombie fact: in the film Night of the Living Dead, they never speak the word zombie; the script [PDF] refers once to zombie, but mostly refers to the undead as ghouls. Wikipedia: "How the creatures in contemporary zombie films came to be called 'zombies' is not fully clear. " 1 Not to mention shitgibbon compounds.